Zack Onisko, CEO at Dribbble, has made a career out of designing products for fast-growing startups. 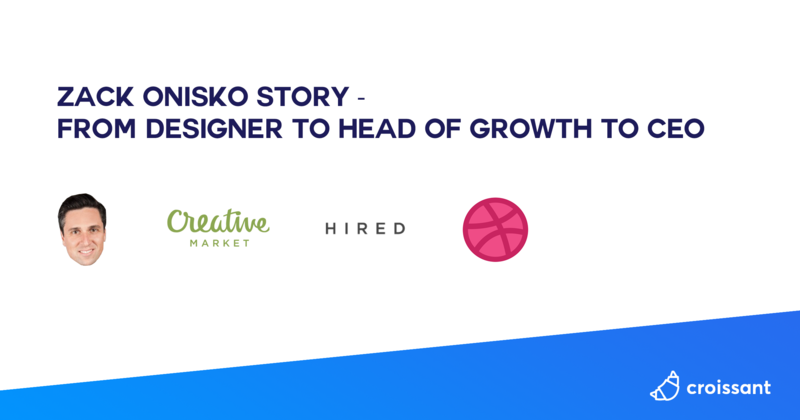 He first started as a designer a few years after the dot-com bubble burst and found his way to managing growth teams for Branchout, Creative Market & Hired. I talked to Zack a few weeks ago to learn more about his career and success stories, what made him switch from design to growth, what he learned building 3 growth teams and how people should think about growth. Below is a lightly edited transcript of the conversation. "The road to $100M doesn't start with product. Which is why the term Product Market Fit never sat right with me. Starting with product puts the cart before the horse. You are starting with the solution, and then trying to fit it to the problem. We need to do the reverse. Start with the market, then look at the product. The problem your company exists to solve lies within your market and target audience, not within your product. Products are built to fit with channels. Channels do not mold to products. The reason for this is that you do not define the rules of the channel. You define your product, but the channel defines the rules of the channel." "The first thing you want to do with any new channels is some initial research to validate if it’s worth dedicating both time and resources to running an MVT for that channel. What separates the best acquisition marketers from everyone else is both their ability and determination to figure out the mechanics of how a certain channel works. At this point we’ve done a lot of research, we’re happy the channel has potential and we understand how the channel works. The next thing you want to list out is your ideas for how to run the MVT. At the end of the time allocated for the test, you need to decide if you want to invest resources/budget/time into scaling the channel or continue looking for new areas of growth". "How do you tell a compelling app story? How many push notifications are too many push notifications? And which unconventional marketing tactic did Tinder employ to triple its user base? The answers to these and more burning questions, along with tips and tricks on how to unlock your app’s mobile potential, can be found in our third annual Mobile Growth Handbook. This year’s contributing experts span far and wide—hailing from Amazon, BuzzFeed, Facebook, Foursquare, Lyft, Tinder, Spotify, Slack, and over fifty more—but they have one thing in common: they know mobile." "What I love about this campaign is that, once it was set up (the guide written, content upgrade created, click popups added, webinar recorded, emails written, etc) it will be making money for Shopify while Corey and the rest of the team sleep. SEO will be driving huge traffic, the automated webinar will be running, and the emails will be sending - all without needing a single moment of time from Shopify's marketing team. Want to know how Shopify increased their userbase by 55% in a single year? How they're about to cross $400 million/year in revenue? It's campaigns like this one." "Most SaaS marketers and analysts measure the success of their campaigns with lifetime value (LTV), cost of acquiring a customer (CAC), and the margin between the two. However, when choosing how to allocate limited capital between two LTV-profitable campaigns, most fail to do any analysis beyond this first step. When measuring your online advertising campaigns, it’s not enough to simply look at LTV and cost unit economics. This can lead to critical oversights and missed opportunities. The velocity at which you’re able to get cash back from your customers and reinvest it into the business dictates how quickly you’re able to grow. Keep that in mind as you make tradeoffs on where to invest your hard-earned cash." "Zola’s NPS scores have improved by over 50%, surpassing both Amazon’s score and the retail industry benchmark. Customer satisfaction has always been a focal point for Ma, who’s held executive and senior product roles at Gilt, Chloe + Isabel and Yahoo!. Now she leads Zola, which is now valued at over $200 million and has been named one of the top 25 tech companies to watch"